These are lyrics by So Solid Crew that we think are kind of repetitive. 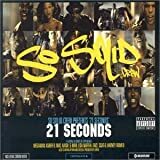 So Solid Crew's, "21 Seconds"
Ah, guys, it's great of you to remind us constantly of what the song's called, you know, in case at any point during listening we might forget! Also, isn't it ironic that since each member supposedly has 21 seconds each to sing in the song - hence that clever title, see! - this guy gets 63 seconds in total or even more? Tut-tut-tut... And who on earth said they liked this bloke to allow him into the studio to record this tinny crud in the first place anyway? Shame on you, whoever you are!